You can make good money on termination of GSM traffic in Nicaragua can if you apply a competent approach to the business. First of all, it is necessary to select the traffic of a large cellular operator to terminate in the country. 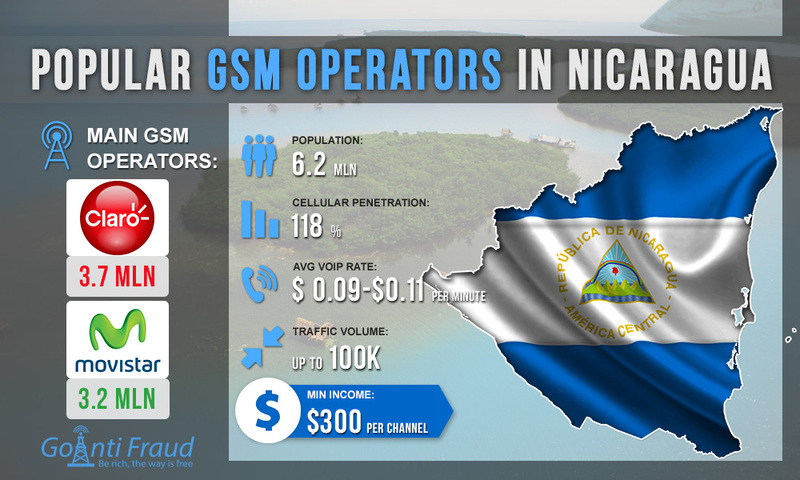 To date, Nicaragua has two major GSM operators: Claro and Movistar. They compete with each other and occupy the main market share (more than 50%). In Nicaragua, SIM-cards of both operators are sold in shops and kiosks without the requirement to produce documents. Claro is a brand of the international company America Movil. The operator has excellent GSM coverage throughout the country. The number of connections is more than 3.7 million. A prepaid SIM card costs about 40 cents and is available throughout Nicaragua. The second place in the market is occupied by Movistar, which is the brand that Telefonica owns. The operator's coverage is slightly worse, in comparison with Claro but only in rural areas. At the same time, the tariffs for Movistar services are lower. Pre-paid SIM-cards are called Prepago Full and Prepago Libre and are sold in the branded Movistar stores. Companies-originators offer an average of $0.11 per minute of the call for terminating Movistar traffic. You will have to pay an average of 9 cents per minute for traffic termination services provided by Claro. They are quite high call voip rates, which allow you to make more than $300 via one channel. We recommend using software solutions from GoAntiFraud to protect SIM-cards from blocking by AntiFraud systems to reduce your business costs and increase profits.